Clearing the AWS certification for Solution Architect, SysOps Associate and Solution Architect Professional has been a long journey of over an year now. NOTE: This is my personal recommendations and tried & tested ones. I started preparing for Azure and was checking for resources, and stumbled upon 3 months Free subscription for LinuxAcademy, PluralSight and OpsUtility. I have got a lot of positive feedback from colleagues taking tests on Braincert. Feel free to provide any feedback or any other resources that you found very helpful and help back the community. can you please a collection of questions for AWS SA- Associate exam? I do not have a separate collection of SA-Associate, but you can look into the preparation guide and important topics and check the practice questions. The questions with longer prose are mainly professional. I have tried to segregate the professional topics and questions for some topics, but its a WIP. Your blog is getting more views, and I’m sure there is more to come!! I got redirected here from several forums. My question is regarding the AWS SA – Associate. Is that a high level exam? I see people wherein they just took cloud guru course, and passed it!! Well, I finished the cloud guru course (Solutions Architect Associate), but I found the course quite “high-level”. The practice exam had question like “What is the best S3 storage class used for data archival (Ans: Glacier)” .. Other question like “What is Alias Record” and I went … “this is high level?”. Frankly from my experience the practice questions in acloud guru are very high level and not close to exam questions. ACloud Guru won’t help you clear exam unless you are hands on experience on AWS and you use it Day in and Day out. Still you need to go through videos, blogs and white papers to clear it. I would suggest go through A Cloud Guru which is a good introduction and will help you cover 50-60% of exam at max. Rest you need to go through the other references and materials for sure. seen and impressed by your blog post. can you please direct me on any important points or topics I have to go there. It is very tough paper ? Frankly speaking , no idea about the type of questions I will face . How many are simple and how many are scenario based ???? Any input will be appreciated ..
For Sys Ops, the topics VPC, IAM, S3, EC2, SQS are very important. Difference from the SA are the CloudWatch, CloudFormation and other Monitoring and Development tools. So be sure to cover those. Also check the Security & Storage Option white papers. Your blog is wonderful!! I am looking to purchase practice test for all associate level exams. Would you recommend WizLab or BrainCert? Hi Panday, I would recommend to go for BrainCert. i have a team of engineer who tried the aws sysops exam , 2 of them pass it w/o sitting on the course with cloudguru video + practise exam . we dont have the luxury to go for lab and test out except using our free tier account. Haven’t got any feedback for the sysops exams getting updated. There were updates for SA … couple of months ago. However, not all the users get the new exam format is what i have heard. Few users might still get the old format without the new topics and that might be the reason. Thank for first of all, i refereed your blog for clearing SAA exam. I have recently completed the solution architect-Associate and now i am dilemma to choose next certification. I am confused whether to take sys-ops or security specialty exam. I don’t see any details about the security specialty exam in this blog. Could you guide me? which one to continue with? I also think sysops is also under associate, will this certification adds up the value. Hi Madhumita, it depends upon what you want to do basically. If you are targeting SA as your role go for SA – Professional. If you want to target DevOps go for SysOps and DevOps Professional. I haven’t checked the Security Speciality, and do not have any plans for the same as well. Please notify me via my mail ID please.. Also i see courses on Edureka , do you have any opinions on that? I am looking forward for the certification but I am bit confused on which one to attempt. 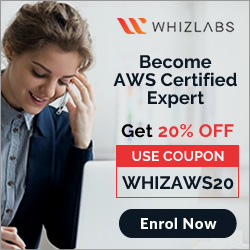 AWS Certified Developer – Associate OR AWS Solution Architect – Associate….????? I have 2.5 years of experience in IT. Q1. Which is Certification is beneficial ? Q2. Should I pay 29$ on “acloudguru” for enrolling into the course or is there any other bettter alternative ? It depends upon what you are targeting … if you are doing development you can target Developer, SA and SA – Pro. If from the Sysops side target SysOps and DevOps. acloudguru courses are available @ $10, so do not pay more. Keep checking the link on my blog, it is available at $10 usually 10 days a month. I have the habit of reading from the books, rather than reading from Video’s. I was searching for the right book for AWS Solution Architect – Professional Exam but couldn’t find one so far. Do you recommend some book also for AWS SA – Professional Exam ? Please guide with the link of the book if you have. Frankly Sandeep, books don’t work here and the content will get old very fast with daily updated from AWS. Its better to read through FAQs, Blogs and trying out things on AWS. Any idea when the SAA exam pattern will change ? I heard from well known person that the AWS SAA exam pattern and syllabus going to be changed from 1st Jan 2018 onwards… its true ? Your post seem to be informative. Do you have any set of practice questions / exams for the Dev exam? I couldn’t find any link in your blog for practice exams. Hi Karthick, All the questions are posted with the topics, there is no separate set. I cleared the associate exams last year with zero professional hands on AWS experience, but it was a lot of work. Now I have a years AWS experience it all seems so much simpler! As a rough guide (regardless of the exam): I’d recommend starting with the relevant acloud.guru(ACG) course, then the linux academy course, then the Cloud Pros (CP) mobile app for a practice test. Interestingly, I noticed that a lot of the content on the CP app for the SAA exam comes straight from the ACG dev course, so I did the ACG dev course before the SAA exam which turned out to be a valuable decision. I also read the whitepapers at a high level (didn’t memorize them), ran up a lot of time in a free tier test environment, read and reread the FAQs a lot, plus this blog. I agree that ACG isn’t enough for the exams, you need a second course from a different vendor. 2 courses, lots of free tier building, and reading the FAQs a few times is enough to get you through. Finally, one of the best things I found was creating an AWS environment for an imaginary company (on a free tier account), after I had done the courses. First, build an environment for a small business in one vpc and put instances in it that can connect to each other and out to the net. Then expand it by adding monitoring and SNS notifications based on cloudwatch alarms, then add another vpc with a peering connection, a static website with a RDS database, use dynamoDB for basic logs etc. Basically set everything up as if it was a real company with as many if the services covered in the coureses as you can, but make sure you don’t go over the free tier limit! This helped a lot. Thats great .. Congrats SM …. Thanks for the good work you and your team are doing here. You guys are awesome. I have cleared the three AWS Associate exams and now want to go for the Advanced Networking Speciatly. Do you guys have any set pf practice questions or any resources you can point me to? Not yet for Advanced Networking, haven’t checked the blueprint but planning to update soon. I am currently studying for the AWS Solutions Architect Exam. I took a 3 day training class in December 2017 thru my job. Studied for a few weeks using Whizlabs scoring around 70% and then took the exam and failed. Next, I ordered the ACloud Guru and watched the videos and practiced the exam questions scoring around 70%. I felt that in order to bring my grade up higher, I would only be memorizing the answers and the explanations were a little weak. So I read about Braincert which has 13 tests (50 questions each) and I ordered that. I am now on test #11. I am concerned because when I first took test #11, I only scored about a 50%. After taking A Cloud Guru and 9 practice tests, I am feeling as if maybe I am not learning how to apply my knowledge to new situations presented. On the other hand, I am wondering if Brancert exams are cumulative such that when you reach the end, you will have sufficient knowledge to pass the exam. Do you have any insight into this and do you have any advice? The key here is to understand the concepts, all the other courses and tests will only help you build that. 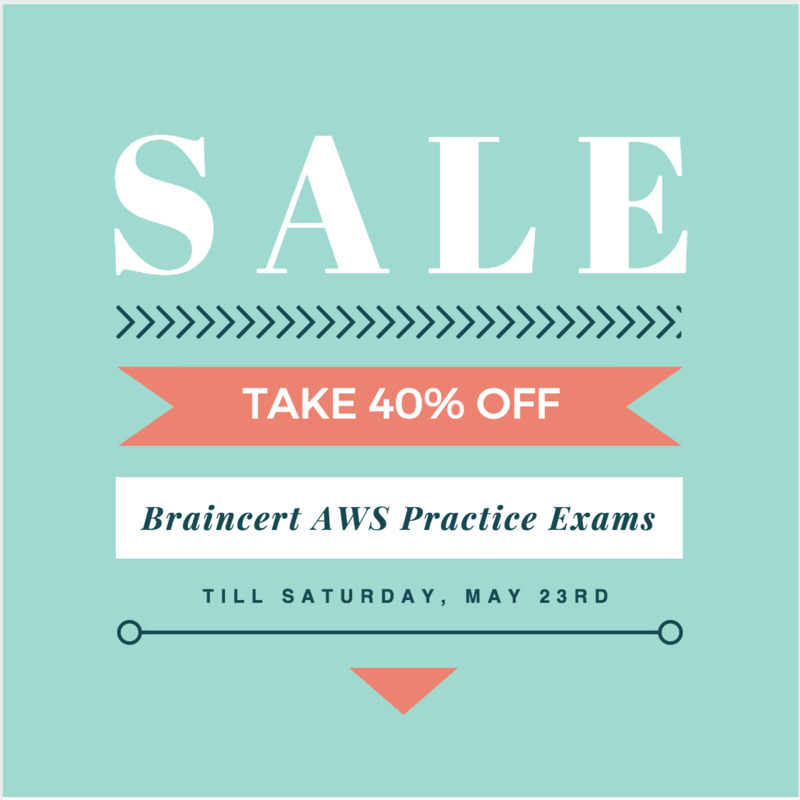 Braincert exams cover a range of topics and aws services and the tests that are at the end are actually with the new services that AWS has introduced. You need to sure you cover all the topics listed preparation guide, understand the concepts, understand both the right and wrong answers logic and you will pass the exam easily. I have recently completed all three AWS certifications and some of your blogs were really helpful during my preparation. My sincere thanks to you for writing these blogs and sharing your knowledge.